Solay Aroma Lamp will enhance any environment with healthy ions and a natural aroma. Use any essential oils you like. It is the perfect size for a desk and smaller spaces. This Aroma lamp can be used with or without the glass plate. Scientific studies have shown that salt crystal lamps can increase the negative ion count by up to 300%. Negative ionized air drastically reduces the number of indoor airborne bacteria and dust. Negative ions also benefit asthma patients, people with chronic lung illnesses, and allergy sufferers. As well, they help improve learning, memory, and emotional well being. By creating a balance of ions in the air, they stimulate natural drive and healthy energy. Their colors create a pleasantly calming and warm environment. 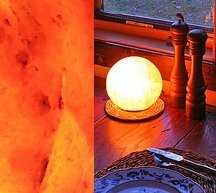 A Solay Salt Lamp is an excellent source of negative ions and is strikingly beautiful, blending favorably with any environment. Heating the salt crystal with a bulb inside the lamp releases negative ions into the air. The salt crystal lamp improves air quality and your bodys health. For a constant ionizing effect, it is recommended that you light your lamp every day for optimal cleansing results. When a lamp warms, it attracts humidity and the surface of the salt crystal becomes damp. Negative ions build up and then released. Crystal salt lamps bind the excessive positive ions with their negative ions. The ions cleanse the air of harmful electro smog and other toxins. Known as Natures Ionizers, Salt Crystal Lamps eliminate a host of indoor air pollutants. Natural salt has been exposed to massive pressure for millions of years, it has resulted in the formation of this durable crystal salt. The more pressure on the crystal salt, the stronger its composition. This is why salt crystal lamps will not reduce in size, color, shape, or their ionizing effect. They are a long-lasting and stunning addition to any home or office.